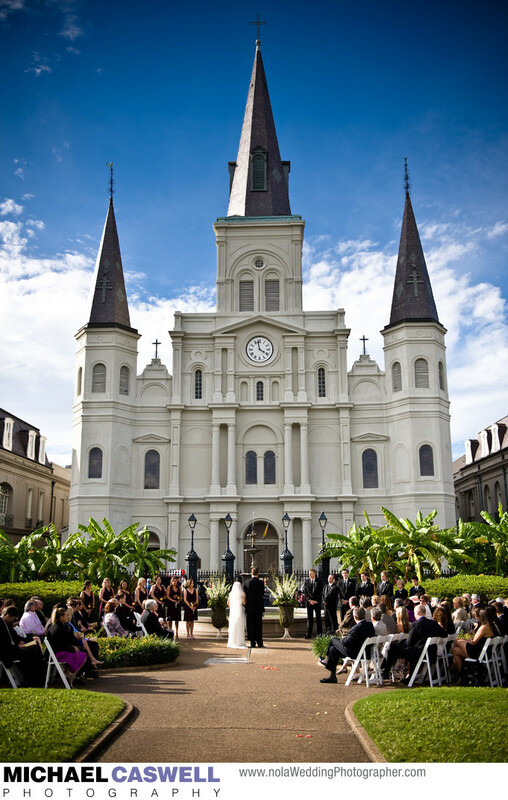 To many couples, a quaint New Orleans wedding ceremony in Jackson Square, with the beautiful backdrop of the iconic Saint Louis Cathedral gracefully rising up behind them and brass bands playing in the background, is even more desirable than getting married inside the famous church itself! One important consideration to be mindful of, however, is that this is in the heart of the French Quarter, and it's not a quiet and peaceful area! Though the park is typically not closed off to the public during wedding ceremonies, pedestrians are almost always courteous and respectful, and thankfully do not walk through the area where the ceremony is taking place. But the pedestrian area between Jackson Square and the Cathedral is a very popular spot for street musicians to perform. To some couples, exchanging vows with the raucous sounds of a brass band playing nearby is the very definition of the perfect New Orleans wedding, as that's just part of the unmistakable trademark ambiance of the French Quarter, but others might want things to be just a little quieter. I've had a few weddings where the coordinator or a family member of the couple has, on their behalf, given a band some money to simply not play for 20 minutes or so! Jackson Square is also an ideal outdoor location for doing the group formal group photographs of the wedding party and families, and portraits of the bride and groom. But you should always have a rain plan in mind, with an alternate indoor ceremony location, just in case! Fortunately, it has not been very common for rain to affect my couples' plans over the years... I've shot many weddings in Jackson Square and only can think of one that was rained out. Because there are so many great reception venues in the vicinity, such as Pat O's on the River, The Jaxson, Riverview Room all right across Decatur Street in the Jax Brewery building, along with Muriel's Restaurant and Latrobe's, and numerous elegant hotels such as the Bourbon Orleans, Omni Royal Orleans, and Royal Sonesta, guest transportation after a Jackson Square wedding ceremony is usually a simple matter. In most cases, everyone can simply walk there, or even better, you can have a second line parade led by a brass band bring you and your guests to the reception in true New Orleans style!